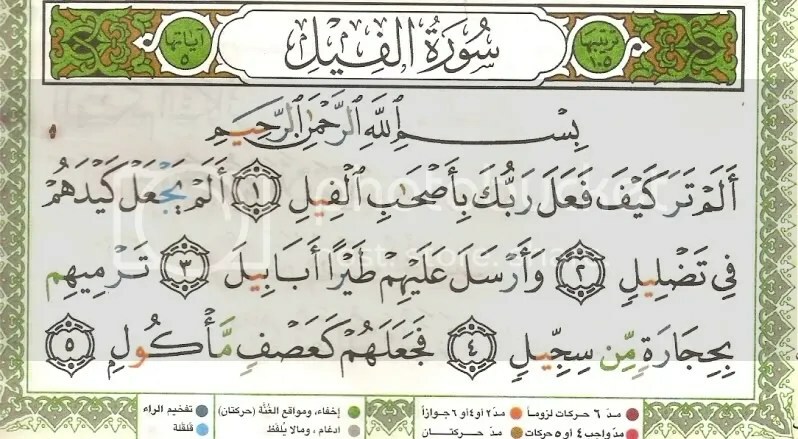 This surah is a favourite choice for either read aloud/ story telling session. Dhu Nafr was captured and taken along with the army of Abrahah. My children have heard the story of Al feel many times. This must be the most favourite read aloud story for the children. So I thought of making it a bit more visual for them. Cut up a picture of elephants heard. So Abrahah built this church so high that people may drop their skull cap looking up to the church. Then he wanted people to make pilgrimage to te church instead of Kaabah in Makkah. he must have thought that by building a grander more sophisticated building, people will immediately flock to it. Kaabah was just a simple structure. But Allah puts love of people to Kabbah than any other. Things happen that finally lead to the charges of army towards Kaabah. It must be quite a sight in the land of arab to see elephants marching. Emphasise is to show that Allah WILLS, Abarahah’s army to win many times to the arabs. Ask them to imagine, the grand march of the elephants trashing through the arab land. Imagine how great and powerful Abrahah must have felt. Finally ask them to imagine the early sign of trouble for Abrahah, when the leader of the elephant mahmoot) refuse to charge to the Kaabah but willing to charge elsewhere. Then a flock of birds came in like some airfighters with three little bombs each. Ask them to imagine the effect of the bomb on those who were hit. Imagine the elephants scamper away. And so were the soldiers. And probably the herds they captured along the way. Think about it and reflect on the current world situation. Imagine how defeated the Arabs felt when some of them tried their very best to stop the Abarahah’s army but failed. Battles after battles and none could stop the mighty elephants as Allah has not will it. Abrahah may have planned, but Allah is the Greatest of all planners. He wills Abarahah’s army to approach Kaabah only to destroyed them at the very end. And when Allah sends the flock of birds pursuing those who intend to destroy the kaabah, can they even run anywhere? When Allah sends down His punishment, no one can escape. Think of these words when you think you want to be naughty. Know that Allah is Al Alim and He sees you all the time. And there is no way that you can hide from His knowledge for he will bring forth even the tiniest grain of sin you are trying to hide. Also think of those who are oppressed by some people. Remember that Allah favours the dua’ of the oppressed ones. And where will the aggressors flee when Allah is pursuing them? Abrahah is among the Christians. While the people in Makkah at that time were pagans. Mushriks. Before Islam came through Prophet Muhammad s.a.w. into the world, people who followed Isa a.s. were the Muslims as long as they believed in One God and Isa is not the God’s son. The Christians were closer To islam compared to the pagans. But Allah were on the pagan’s side. Why do you think? 3. these are all in preparation of greater events to follow suit. Allah in indeed the best of planner. Allahu Akbar. 4. The most complete religion will be revealed in Makkah which is Islam. And thus is the religion to be followed and not Christianity. Thank you for sending me this beautiful surah..Thanks for remembering me..God bless you. for what difficulties do we use this duah ?